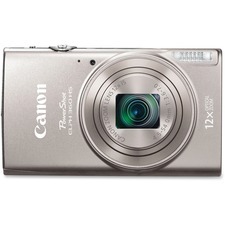 Silver Cyber-shot W120 Digital camera features 7.2 megapixel resolution, 2.5" LCD screen, face detection, Smile Shutter Mode, Carl Zeiss Vario-Tessar lens with 4X optical zoom and blur-reduction technologies (ISO). With settings up to ISO 3200, you can shoot effectively in low light without flash, while Sony Clear RAW Noise Reduction system helps suppress color noise that can degrade low-light shots. Digital camera measures auto-focus at 9 precision points instead of 5, giving you greater creative freedom to compose your image. Burst mode lets you fire off three shots automatically at 1-second intervals (VGA standard mode) or 2-second intervals (full resolution mode) to get every shot you need. 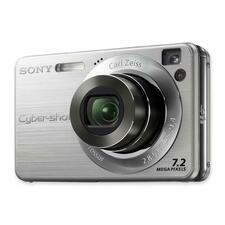 Digital camera offers 15MB internal flash memory, 2.0X digital zoom lens, photo modes and function guide. Includes a lithium ion battery. Storage can be expanded with 16GB Memory Stick Duo (sold separately) or Memory Stick PRO Duo flash media cards (sold separately). HDTV compatible. 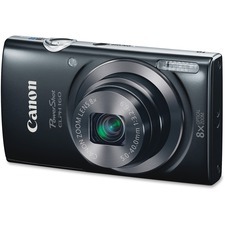 Easy to use and stylish, the PowerShot ELPH 160 Digital Camera is designed for hassle-free capture of special memories. 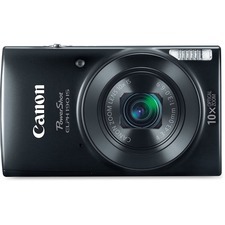 Slim, lightweight camera boasts a big 8X Optical Zoom so you can get close to your subjects quickly. Image quality is sharp and detailed thanks to the high-resolution, 20.0 Megapixel sensor plus DIGIC 4+ Image Processor. 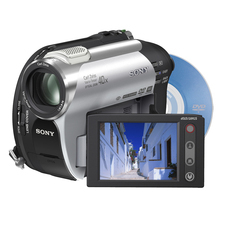 When you're ready to shoot impressive 720p HD video, simply press the dedicated movie button. When you shoot in Smart AUTO mode, the camera automatically chooses the proper camera settings by analyzing the scene based on several common and more unique predefined shooting situations so achieving the best possible image quality can be effortless. Scene Modes such as Fisheye Effect, Toy Camera Effect and Monochrome provide creative freedom to capture your photos. Help button provides clear explanations and guidance for camera operations. ECO Mode helps reduce power consumption for longer battery life. All-in-one conference camera is sleek, portable and a snap to set up. 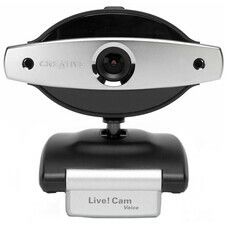 Optimized for teams of one to six, this conference camera offers HD 1080p video, 360-degree sound and a wireless screen-mirror projection in virtually any work space. Multi-device connectivity lets you connect to your computer to conduct lifelike meetings within your familiar computing environment. Or, use the convenience of wireless connectivity for audio pairing from a compatible mobile device. 90-degree field of view with digital pan, tilt and 4X digital zoom in Full HD let you interact with everyone at the table. Acoustic echo and noise-cancelling technology make it seem like conversations are happening in the same room. USB plug-and-play connectivity simplifies setup for immediate use. Rechargeable battery runs video calls/screen mirroring for up to 3 hours or speakerphone for up to 15 hours. H.264 UVC 1.5 with Scalable Video Coding to free up laptop bandwidth. It's a first for webcams! Creative Live! 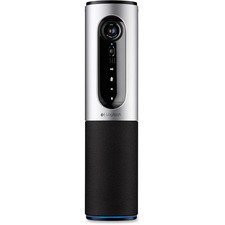 Cam Voice captures true 1.3 Megapixel video, 5.0 Megapixel photos, crystal clear voice, and an incredible wide field of view. You'll always look and sound your best to friends and family. EOS Rebel T5i with STM lens makes it simple and intuitive to create breathtaking photos. 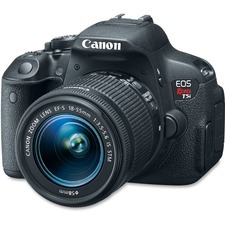 Incredible image quality starts with an 18.0 Megapixel CMOS (APS-C) sensor and Canon's superb DIGIC 5 Image Processor. Combined with an extensive ISO range of 100-12800, this digital camera boasts crisp, detailed images, even in low-light situations. Continuous shooting speed of up to 5.0 fps allows fast action capture. Nine cross-type AF focus points help ensure crisp focus throughout the frame. The Hybrid CMOS AF system enables speedy and accurate autofocus when shooting in Live View mode. EOS Full HD Movie mode with Movie Servo AF makes shooting high-quality movies easy. Brilliant Vari-angle 3" Clear View Touch Screen with smudge-resistant coating features multi-touch operation and Touch AF for an easy, intuitive experience, flexible positioning, and clear viewing even when outdoors. Seven Creative Filters, viewable in real time, put composition control directly in your hands. 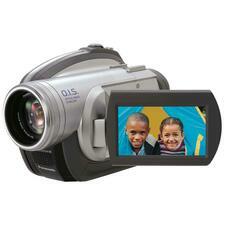 Versatile and powerful - the DCR-DVD108 Handycam DVD camcorder takes video capturing to a new level. Record directly to DVD-R/-RW/+RW/+R Dual Layer media formats. The built-in Memory Stick Duo media slot and USB 2.0 connection allow you to show off your video almost as fast as you captured it. The Carl Zeiss Vario-Tessar Lens with 40x optical/2000x digital zoom keeps you close to the action while the Super SteadyShot technology and Super NightShot feature make sure it looks perfect.